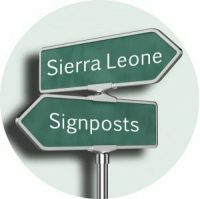 Do we, in Sierra Leone, have the capacity in terms of people trained or experienced in managing complex crises? I believe we do. In 1995, as the UN Representative in newly independent Eritrea, I was charged to help the government bring back over 100,000 refugees from Sudan. When I got to the border to meet the first convoy, imagine my pleasant surprise when the person leading them turned out to be a Sierra Leonean. To manage that number of people with the status of refugees is no small feat. You contend with food distribution issues, social issues, crime, communications, and a host of other challenges. I am sure there are so many more examples of other Sierra Leonean experts in so many more fields. I hope that if certain names are not politically correct, at least donors would use them rather than bring in motivated by inexperienced outsiders who learn on the job.